Fair warning: I’m going to get a bit negative with this review and I am going to delve into spoilers. Justice League has firmly established DC’s place as a second rate super hero film universe. The movie is not anywhere near the level of craftsmanship from today’s Marvel movies. Guardians of the Galaxy 2, Spider-man Homecoming, and Thor: Ragnarok are all vastly superior films. Sadly, DC is stuck two decades in the past with another mediocre super hero movie. It’s a shame as I really am a DC comic fan. Batman and Superman are great characters. The Wonder Woman film was pretty good. So what went wrong with this one? First off, the main villain sucked. The big bad in this movie is a character named Steppenwolf. He’s a really tall guy with a fiery ax who is completely CGI. He is bent on conquest and he has his sights set on Earth. Unfortunately the character’s personality is forgettable, there’s no charisma or panache, his dialog is unmemorable, and he doesn’t even have any cool powers. To top it all off, his design is boring. He’s just a large humanoid with a helmet. In comparison to Ego, the Vulture or Hela, Steppenwolf is more of a bad third rate video game villain you defeat early in the game as you work your way up to the more notable and interesting bad guys. In short, he had no business being in this movie. Everything about him sucked. The only thing they got right was his army of parademons. Transitioning to the good guys, the movie continued to make missteps and fall short of the mark. The dialog, including the humor, was very amateurish. It was on the level of a B-list action movie. 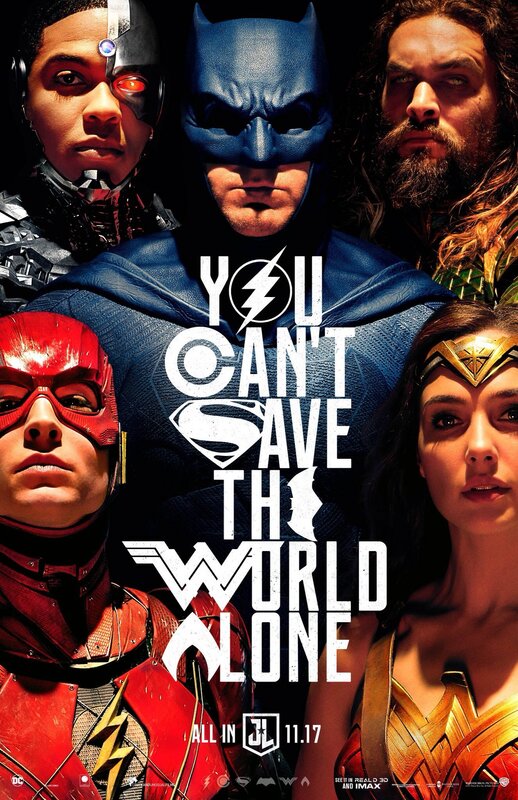 The members of the Justice League come off as petulant children who see saving the world as a chore they’d rather not do. Batman and Wonder Woman are the mom and dad that have to cajole everyone into stepping up. Superman is of course brought back to life, which makes his whole death seem like a pointless waste of time. Even more wasteful, his reincarnation leads to a mini-battle where everyone has to fight him again. I don’t think anyone wanted to see that, but they cram it in. Thankfully they do snap him out of it and we do get the most friendliest Superman yet. However he gets sidelined for a good chunk of the film as he hangs out in a cornfield with Lois Lane. The major plot point of the whole thing is that Steppenwolf is trying to collect three mother boxes so he can reshape Earth into his homeworld/open a portal to Darkseid. It’s a little murky as both motivations are mentioned and you really have to know the comic book backgrounds to get what’s really going on. There’s nothing subtle about the writing as the dialog will often bold face say the plot, but it doesn’t clearly layout what Steppenwolf is doing because the plot focuses more on the action rather than the story. The CGI design for the worldshaping is about as lackluster as everything else. There’s also a lot of time wasted on this Russian family that was completely unneeded. So, is there anything good about the film? I mean I was entertained and the movie was okay, but I don’t have any compulsion to ever watch it again. I actually liked Batman v Superman, and it is a movie I don’t mind watching again even though it had its own shortcomings. But Justice League just isn’t as good. If DC really does decide to make a sequel, they need to step up their game with better writing, better visual design, and a better story. They are going to have a hard time entertaining anyone with subpar movies like this.